Deruta Drawn Thread Work - New book! 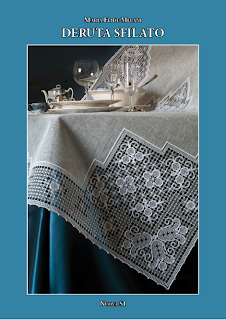 Bosa Filet Lace - New book! 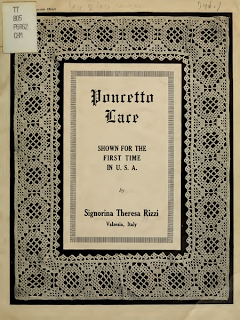 Some years ago while searching in the World Catalogue, I came across a book published in 1917 by Theresa Rizzi. It was called: Poncetto Lace. I wrote to the curator of textiles at the Smithsonian Museum where the book was held and asked if it was possible to obtain a copy since the text was old enough to be out of copyright. The curator sent me some scans of the text and asked that I not circulate them as they were part of the Smithsonian's collection. She also said that the Museum had future plans to start publishing scans of the texts in their collection on the Internet Archive and at some future date this book would be there in the public domain. I'm excited to tell you that it has now been added to the Internet Archive and you can download it yourself here. 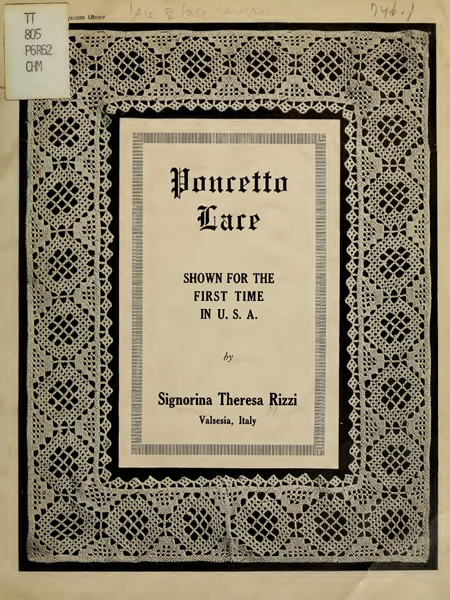 This is the only dedicated manual for Puncetto needle lace written in English that I know of. Before you get too excited, this is a manual from 1917, so if you're familiar with old instruction manuals, you'll know that step-by step photos didn't exist due to the high cost of reproducing photography so instructions were written out and sometimes very difficult to follow. Theresa Rizzi has, however written this booklet with the intention of her readers being able to learn from her instructions so it is better than a lot of old manuals from the period. The only thing I found unclear was how to start a piece not attached to a piece of fabric. However, thankfully today there are other ways to learn this, one being an excellent video series on YouTube (start with Puncetto Anfang). 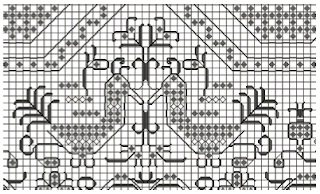 Poncetto Lace is only 16 pages long and has a few patterns for insertions and edgings. While it is not an exhaustive how-to manual, it may just help you to understand a bit more if you've been struggling with Italian instructions. What a lovely surprise in the mail on Friday! A long-awaited book on Deruta Drawn Thread Work by Maria Elide Melani of the Association Ago, Aga e Fantasia. While the text is in Italian, there are a great many step-by-step photos to take you through the set-up, the stitches and the edgings that you should be able to understand what to do with little trouble. The book is packed full of colour photos of lovely projects and finished works. There are a dozen or so stitches explained and 13 patterns. This book is the fruit of many years of research and exploration of this almost forgotten technique born in Quarrata in the province of Pistoia in the Tuscan region of Italy. Maria Elide is a delightful teacher and it is well worth your time to take a side trip from Florence to visit her in Pistoia. You can purchase directly from the publisher, Nuova S1 via bank transfer or with PayPal from Tombolo Disegni (send an email request to order). 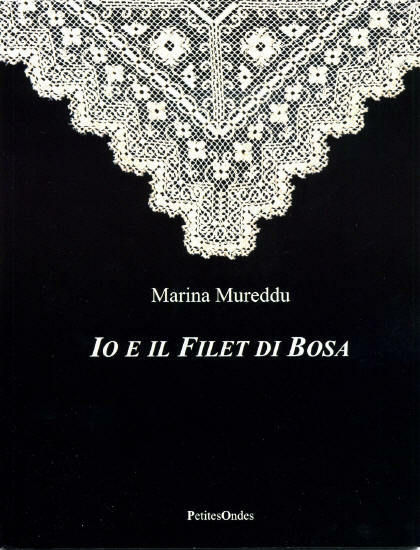 There are not many books on Bosa Filet Lace. In fact, there is only one that I know of which is out of print and completely unfindable (if that is a word). Imagine my excitement therefore to discover this new book which is available through the publisher Petites Ondes (free shipping until the end of June) or LuLu Print-On-Demand Books. You can download a preview of the book (text in Italian) from the Petites Ondes page, click on "Sfoglia un'antiprima" on the right side of the page under the photo of the piece of netting mounted on a frame. Image copyright Petite Ondes and Marina Mureddu. The softcover book is 108 pages, printed in black and white with Italian text written by Marina Mureddu, a Sardinian woman from Cagliari which is in the southern part of Sardinia. Signora Mureddu learned Bosa Filet Lace from the granddaughter of a famous woman from Bosa, named Olimpia Melis who achieved international fame with her Bosa Filet Lace at the beginning of the 20th century. Olimpia Melis exported works all over Europe and to New York, things like: borders, curtains, tablecloths and other household items made by several hundred Bosa Filet Lacemakers. Over a period of several years, Marina Mureddu was able to study some of these original works and make patterns. The book contains some history, instructions, patterns and photographs.